We admire our teachers who celebrate and share their students’ voices every day. 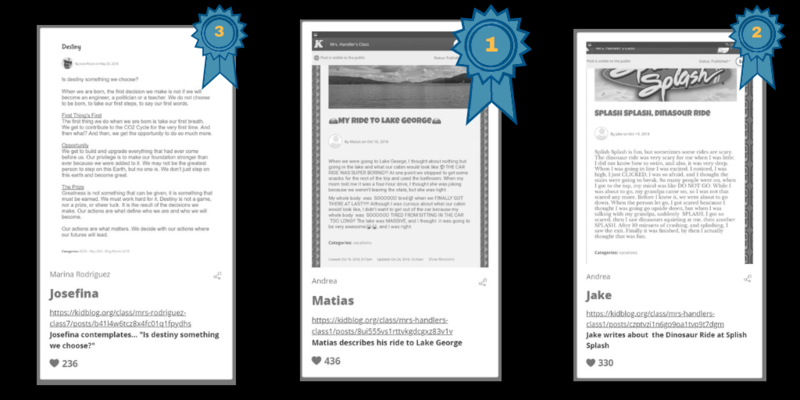 Over the past month, we invited Kidblog teachers to take it one step further by promoting their students’ work as an entry to our student blog post contest. With the closing of the contest, it’s now clearer than ever that our teaching community shares in our mission to empower students to share their voices with an authentic audience. After receiving submissions from educators all over the world, families, peers, and the public came together to read, reflect, vote, and promote student work. The Kidblog team had an amazing time reading every single student post submitted, and we received feedback that students were overjoyed to have so many people reading, commenting on, and voting for their posts. Why we love it: Everyone remembers the best parts and the worst parts of life, but there is a whole lot in the middle that we forget about. Describing a car ride, even a boring one, helps us remember to appreciate all the moments in between. Thanks, Matias for sharing your story! Description: Jake writes about the dinosaur ride at Splish Splash. Why we love it: We can feel the thrill of this experience! Who hasn’t been more than a little scared at the top of a water ride? Fabulous sensory details and relatable descriptions of overcoming fears to find fun on the other side. Thank you, Jake, for sharing your story. Why we love it: Josefina, you’ve captured not only your own thoughts in this post but a uniquely poignant introspection on decisions and opportunities. We’re enamored by your eloquence and will carry a couple of your powerful messages with us for years to come including but not limited to “Our actions are what matters. We decide with our actions where our futures will lead.” Thank you for sharing your voice with us and the world Josefina! You can read all entries at http://bit.ly/KidblogContest. Keep up the extraordinary work, Kidblog community! Grace is a Marketing Manager at Kidblog. She enjoys discovering new ways to ignite the world's passion for blogging, and hearing from teachers about all the ways students are benefiting from Kidblog in and outside the classroom! Grace loves teaching painting, photographing the beautiful state of MN, and snuggling her two cats Piper and Opal.